SCO delegation heads in Bishkek. Prime Ministers from SCO member countries met in Bishkek, the capital of Kyrgyzstan, on November 2 and 3 to chart a course for future cooperation among members of the crucial Eurasian organization. Prime Ministers of the Shanghai Cooperation Organization (SCO) states held the 15th meeting of the Council of Heads of Government in the Kyrgyz capital Bishkek, on November 2 and 3. During the two-day meeting, both in restricted and extended formats, the ministers discussed issues as high priorities for the SCO member-countries. Key subjects on the agenda included prospects of boosting trade and economic cooperation between SCO members, mechanisms for financial support for project activities between 2012 and 2016, the list of projects for 2017-21, implementation of agreements reached by the Council of Heads of State during the June summit, in Tashkent, and enhancing regional security by jointly countering terrorism, extremism, separatism and illegal drug-trafficking. Kyrgyz Prime Minister Sooronbay Zheenbekov presided over the meeting attended by all SCO Heads of Government, including Russian Prime Minister Dmitry Medevedev, Chinese Prime Minister Li Keqiang, Kazakh Prime Minister Bakhytzhan Sagintayev, Tajik Prime Minister Kohir Rasulzoda and Uzbek First Deputy Prime Minister Rustam Azimov. 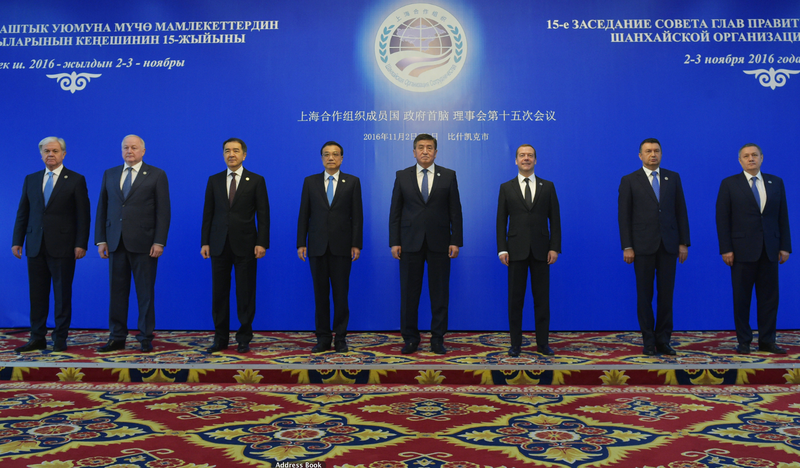 The Council of Heads of Government is the second highest body of the SCO, and holds meetings annually to charter the course of development of cooperation between in different fields. The SCO was established in 2001to tackle regional terrorist threats and promote political, economic and cultural cooperation in the Eurasian region. Russia, China, Kyrgyzstan, Kazakhstan, Uzbekistan and Tajikistan are the founding SCO members. India and Pakistan have been admitted as members of the organization, while Belarus, Iran, Afghanistan and Mongolia have observer status in the grouping. Armenia, Azerbaijan, Nepal, Sri Lanka, Cambodia and Turkey are dialogue partners of the organization, while guests include the trade blocs of ASEAN, the CIS and Turkmenistan. At the SCO summit in Tashkent in June 2016, India and Pakistan were admitted as full members. They are in the process of fulfilling various obligations in the organization’s structures, and will attend the SCO summit in Astana (Kazakhstan) in June 2017. The prime ministerial participants signed a total of 12 agreements and a joint communiqué at the end of the Bishkek meeting. The agreements comprised the decision to set up the SCO Development Bank, the report of the SCO Secretariat on the implementation of the programme of multilateral trade and economic cooperation, a list of activities for further development of projects within the SCO framework for the period 2017-21, action plan for implementation of the agreement between SCO members on scientific and technical cooperation for 2016-20, the SCO road development plan and the SCO budget for 2017. This was the first time SCO leaders signed a list of long-term projects within the framework of the SCO, in the areas of trade and economy, finance and banking cooperation, infrastructural development, and environmental protection. Under the SCO road development plan, the countries that do not have access to the sea would be able to use other transport corridors. “We support the initiative of China and Russia on the creation of the “Silk Road,” Kyrgyz PM Zheenbekov said in his address. He said the SCO needed to provide funding for the different projects, because it was necessary to continue work to establish the SCO Bank and the SCO Development Fund. “We need a comprehensive plan of cooperation for the development of industry, trade and the provision of services,” he added. Russian PM Medvedev said that SCO member-countries are effectively cooperating and working together to accomplish a number of tasks, approved by the grouping. “Despite the current situation and existing economic problems, one can say today that the values at the heart of the project to create the Shanghai Cooperation Organization, have been implemented, and that we work together to address a large number of internal and international tasks, including security matters, crime control, and certainly the accomplishment of topical economic projects relating to infrastructure,” he said. However, he noted that all the economic goals had not been achieved. “We have stated that there are goals we have yet to reach. There are economic tasks we have yet to address,” Medvedev said. Medvedev also drew attention to the need to focus efforts on creating conditions, facilitating the movement of goods, services, investments, and in reaching each other’s and third country markets. He also said food and energy security should be the SCO’s centre of attention. Chinese Premier Li called upon the SCO to create a free trade zone to remove trade barriers among the members, to boost trade and economic cooperation. “We are open to cooperation and ready to discuss the creation of a free trade zone. This will help to remove trade barriers,” he said. He also sought smooth coordination and dovetailing of development strategies among the members, citing the need to increase synergy between China’s proposed “One Belt, One Road” (OBOR) plan and the Russia-led Eurasian Economic Union (EEU). Andrei Denisov, Russia’s Ambassador to China, said on October 31 that China’s Silk Road Economic Belt has been adapted to Russia’s Eurasian integration programme. “There has been a significant progress in determining the mechanism of interaction between the Eurasian integration project and the Silk Road concept,” Denisov said in an interview to Tass. The joint communiqué also said that initiatives proposed for regional economic cooperation, including China’s OBOR plan, are conducive to seeking new models for international cooperation and further strengthening of SCO ties. The participants also agreed that expanding and deepening cooperation among SCO members is in line with overall interests of the sustainable development of their economies, the communiqué said. They also exchanged views on regional security cooperation, in relation to the volatile situation after a resurgence of terrorist attacks by various radical Islamic groups, including the Islamic State (IS), especially in the Eurasian region. M.J. Akbar, Minister of State for External Affairs, who represented India, said terrorism is the “single most significant threat” to peace and stability. He welcomed the clear view of the SCO on terrorism from its inception, reaffirming India’s strong commitment to combat international terrorism, in all its forms and manifestations. “We reiterate our strong commitment to combat this menace in all its forms and manifestations, and stress there can be no justification for acts of terror on any grounds whatsoever,” he said. “We strongly believe that our fight against terrorism should not only seek to eliminate terrorists, and disrupt terrorist organizations and networks, but should also identify, hold accountable and take strong measures against states which encourage, support and finance terrorism, provide sanctuary to terrorists and terror groups, and falsely extol their virtues,” Akbar said. “We condemn in the strongest terms the recent barbaric terror attacks in the region,” he said. Sartaj Aziz, Foreign Affairs Advisor to Pakistani Prime Minister Nawaz Sharif, also attended. Akbar urged all countries to work to expedite adoption of the draft Comprehensive Convention on International Terrorism (CCIT) in the UNGA without any further delay. The next annual SCO meet of the Council of Heads of Government will be held in Russia in 2017. Medvedev said he was glad to take on the baton to go ahead.